The Dramatica Writers DreamKit is powered by the same patented Story Engine as Dramatica Pro, which keeps track of the relationships among your characters, plot, and theme to ensure perfect story structure. Owners of the Dramatica Writers DreamKit can later upgrade to Dramatica Pro at a reduced rate! How it works: Writer's DreamKit takes an author through a step by step path to creating a story concept and developing it into a detailed sequential treatment. The treatment forms a complete blueprint for character growth, plot progression, and the exploration of thematic issues. 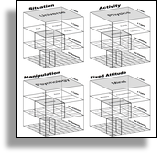 By answering multiple choice questions and filling in specifics, Dramatica's Story Engine is actually able to predict the perfect dramatic structure for your story based on your dramatic choices. But the help doesn't end with a perfect structure. Using DreamKit, you'll be guided step-by-step through the process of turning your sound structure into a complete sequential outline of your scenes or chapters, as you develop your story in your own words. 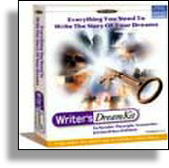 What's the difference between Writers DreamKit and Dramatica Pro? Both use exactly the same patented Story Engine to interactively keep track of the dramatic relationships in your story. The main difference is that Pro tracks more story points, and has several additional sophisticated features, such as the Theme Browser, the Plot Progression table and additional character elements. Pro also includes it's own beginner's path that is more detailed than DreamKit's because it introduces the user to the advanced features as well. In short, DreamKit is designed specifically with the novice writer in mind. It is the perfect introduction to writing, and the perfect place to begin exploring Dramatica's approach to story. DreamKit can carry you through a complete novel, television episode, or screenplay. It has all the essential features of Dramatica Pro, but costs far less because it doesn't include the additional advanced features. Whichever product you choose, Dramatica is the only software with a patented Story Engine which interactively tracks the dramatic relationships in your story to ensure an absolutely sound structure. So, get started writing the story you've always dreamed of today with the most sophisticated and revolutionary story development software ever created! What IS the Writer's Survival Kit? 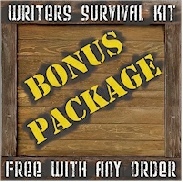 Just purchase any of our products for as little as $9.95 and you'll get instant access to the Writer's Survival Kit.